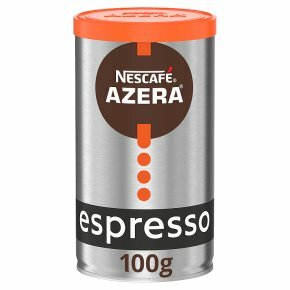 NESCAFE Azera Espresso: A bold blend of instant coffee and finely ground coffee beans, with an intense aroma. This balanced dark fusion delivers a vibrant flavour with an irresistible velvety coffee crema. Full and Rich. Bring the taste of barista-style coffee home with a premium espresso. Made with quality coffee beans for a rich, intense flavour. Enjoy a fusion of instant and finely ground roasted coffee beans. Each cup is topped with a layer of velvety coffee crema. Prepare your instant espresso in moments using just hot water. Discover espresso coffee at home with NESCAFÉ AZERA Espresso, a blend of instant coffee and finely ground roasted coffee beans.